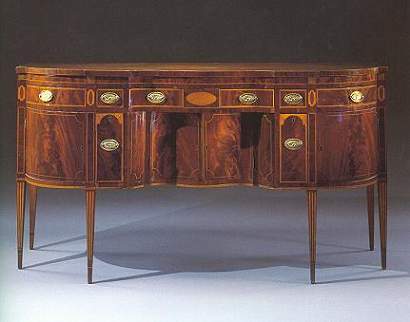 Very fine federal inlaid mahogany "D" shaped sideboard, with inset serpentine center and rounded corners above a conforming case fitted with serpentine-front drawer with an oval reserve over conforming string inlaid doors flanked by banded short drawers above tombstone-inlaid bottle drawers; the string-inlaid doors flanked and centered by stiles inlaid with rectangles above square tapering legs inlaid to simulate fluting, with banded cuffs. New York, 1790-1810. 42 1/2" high; 77" long; 27 3/4" deep.